Late 2011 Rachel Lovelock Yeomans – a fashion designer graduate from Central Saint Martins – sent me interview questions about my project Hyper and the abstract concept of the fourth dimension. Rachel is interested in the subject matter as her dissertation dealt with the concepts of time, the fourth dimension, faceted realities and how they are given expression via the arts. I am posting the interview here, as answering her questions felt quite relevant to me. 1. Scientific phenomena and ideas seem to be a major influence in your artistic approach. By combing ideas described in metaphysics with your own artistic practice how do you feel you contribute to each discipline? 2. What was your intention behind the HYPER project? 3. Do you link ideas of time as described in special relativity with hyper-space and your HYPER project? 4. How successful do you think HYPER was? How was it received by the general public? 5. 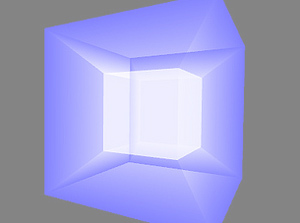 Do you think we are coming any closer with our understanding / visualization of the fourth dimension? Posted in Research and tagged 2011, fourth dimension, hyper, interview.